Ali: Why do you cry? Emmi: Because I'm so happy on the one hand, and on the other, I can't bear it. All this hatred from everyone. Sometimes I wish I were all alone with you in the world. Criterion's debut foray into the world of German New Wave icon, Rainer Werner Fassbinder comes in the form of this two-disc edition of the director's 1974 masterwork, Angst Essen Seele Auf (literally, Fear Eats Soul, anglicized as Ali: Fear Eats the Soul). Near the end of 1970, Fassbinder, who until that time had created a profuse collection of art films bridging his theatrical and celluloid coexistence, discovered American director Douglas Sirk's work via a retrospective exhibition at Munich's Filmmuseum. This exposure would have a lasting and profound influence on Fassbinder, providing an example of the effective use of melodrama, which at the time ran counter to the philosophies of the new era of the German film movement. Of particular interest to Fassbinder was Sirk's All That Heaven Allows which, apart from its Hollywood ending, brilliantly portrayed the conflict of finding true happiness while conforming to social norms. In Sirk's story, a recent widow finds herself in love with a younger man below her station. While there is disagreement as to whether Ali: Fear Eats the Soul is a remake or not, Fassbinder certainly borrowed the concept and expanded on it, using characters introduced in his own 1970 The American Soldier. Seeking refuge from the rain on the way home from her cleaning job, an aging widow steps inside a local bar frequented by foreign workers. Although Emmi is out of place, the ice is broken when a young Moroccan auto mechanic known as Ali, asks the woman to dance. While from completely different worlds, the two strike up a rapport. Emmi is native German through and through, and a proud former member of the Socialist party; immigrant Ali speaks in broken German, knowing full well he is an outsider in his new home, but the two share the same feeling of loneliness and isolation in their respective lives. As their relationship develops, however, it is met by hostile criticism from those around them. Emmi is ostracized by her neighbors and co-workers, whose traditional German values spark disgust at the thought of one of their own having an affair with an ausl�nder. This xenophobic reaction extends to her children, who disown her when she announces their pending marriage. Ever hopeful, Emmi and Ali are married, but the disapproval from the outside world builds a seemingly inescapable environment. Emmi decides that the two of them need to get away from the familiar surroundings, and that when they return things will go back to normal. Strangely, they do, as one by one those opposed to their relationship reacquaint themselves, if only to serve their own selfish ends. But the fear of the unknown that had inspired the venomous backlash has left its mark on the couple, who find in themselves doubts about what they are doing that may be their unraveling. Shot in just 15 days—fast even by Fassbinder's standards—Ali: Fear Eats the Soul succeeds on many levels. Foremost are the stellar performances by Brigitte Mira and El Hedi ben Salem, who bring their characters to life with depth and dimension, utilizing the sparse dialogue to compliment the evocations of emotional torment lying just below the surface. The supporting cast, often exaggerated in behavior, create the rigid social structure that reinforces the accepted boundaries the pair must operate within. The age and class issues found in All That Heaven Allows are further deepened with the director's observations of German society and racial tensions. From a literary perspective, Fassbinder contrasts the pressures of living within the constrains of modern society by shifting the conflict from external to internal�as the world around them adjusts to the non-traditional relationship, their own insecurities pose another barrier to their survival as a couple. From a visual standpoint, the cinematography and locations are effective in maintaining the mood throughout, with bright, unexpected flourishes of color, such as Emmi's unveiling of her dress, or the sea of tables in an outdoor restaurant. As always, Fassbinder's rigid composition plays an important role, adding to the sense of confinement by framing through doorways or windows, or heightening the sense of isolation with vast wide shots, where characters are dwarfed by their surroundings. The camera often lingers, giving time for the weight of the scene to digest. For all its criticisms of prejudice and the hypocrisies of the German class system, Ali: Fear Eats the Soul also demonstrates a keen sensitivity to human frailty and loneliness, and the innate desire and resilience to find happiness. Image Transfer Review: Criterion presents a beautiful new transfer at the film's correct aspect ratio. Colors are gorgeous�richly saturated, yet maintaining subtlety, with deep, dark blacks. Detail level is excellent, grain is naturally rendered, and the source is all but free of blemishes. Aside from some minor shimmering in places, this looks perfect. Audio Transfer Review: The mono German soundtrack is clean and free of any extranious hiss, pops or static. Due to the way it was originally produced (see the Thea Eym�sz supplement for more on this), looped dialogue is often slightly out of sync, but is clear, and the frequency coverage is natural. Considering the budget, I wouldn't expect anything more. Extras Review: There is a good selection of extra material to be had, with all but the theatrical trailer on the second disc. Inspired by a real life experience, director Shahbaz Noshir reunites Ali: Fear Eats the Soul actress Brigitte Mira, cinematographer J�rgen J�rges and editor Thea Eym�sz in his 2002 short film, Angst isst Seele auf. Shot from a first-person perspective, it recounts an attack on a foreign actor by neo-Nazis while on his way to a stage performance of Fassbinder's screenplay. Three 2003 interviews are also provided, opening with director Todd Haynes (22m:45s), who discusses the influence of Douglas Sirk's All That Heaven Allows on both Fassbinder's career and his own Far From Heaven. The second features actress Brigitte Mira, who recounts her memories of Fassbinder. Finally, for the first time on camera, editor Thea Eym�sz discusses her working relationship with the director, and in particular the challenges faced on Ali: Fear Eats the Soul. All three pieces add extra depth to the understanding of the man and his work. In 1976, the BBC television program, Omnibus, did a feature highlighting the personalities behind the new German cinema movement. Signs of Vigorous Life: New German Cinema (32m:18s) features interview footage with Werner Herzog, Wim Wenders, Volker Schlondorff, and Rainer Werner Fassbinder. While still photos had to be substituted for some of the film footage in the original, this feature offers a perspective that's contemporary to the feature, while also featuring behind-the-scenes footage of the shoot on Fassbinder's Chinese Roulette. 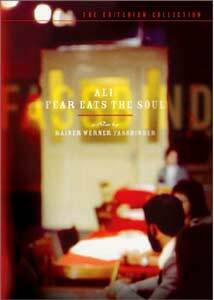 Fassbinder first introduced the characters and story for Ali: Fear Eats the Soul in his 1970 The American Soldier. This 2m:44s excerpt contains the scene where a hotel chambermaid (Margarethe von Trotta) tells their tale from the foot of a bed occupied by two naked lovers. A 16-page booklet is also included, featuring two essays on the film, the first by critic Chris Fujiwara, the second a reprint of a 1990 introduction to the screenplay by author Michael T�teberg. New German Cinema's most prolific figure, Rainer Werner Fassbinder gets the Criterion treatment in this fine two-disc set. Ali: Fear Eats the Soul is a remarkable film�brilliantly executed, poignant in its observations of the human condition, and relevant in its social commentary. Criterion adorns their gorgeous new transfer with a typically suitable collection of both vintage and contemporary extras. Highly recommended.